So, I woke up yesterday evening much less maudlin - to keep using that word - since my last post. Ah, sleep. The world is such a fretful place without it. Why is that, I wonder? Mike received quite the promotional mailout from the M Resort for this month. Thanks to his friend who visited in November (and shared Mike's slot card), we had $50 in free slot play for the start of the month. No strings attached. Wow. No, "wow" is more like "and we have another $250 in guaranteed free slot play throughout the month, plus four bottles of wine, plus some bookends, plus a set of fleece wear, plus $100 in dining vouchers, plus several days of 'mystery free slot play,' plus a free two-night stay, again with no strings attached." Which is more like, WOW. And it's not like Darren did that much play. Wow. Thanks Darren. We wanted to eat there, but the cafe now closes at 10 p.m. Yes, even on busy holidays. Biz-arre. Now the deli is open almost 24/7, but honestly? It's like a tiny, depressing food court. Maybe the food is great, and I do love sandwiches, but the dining area is not conducive to relaxation. The Italian restaurant was open for another hour, but the decor was too off-putting for our be-jeaned selves. Yeah, even though the joint appeared to be empty. (Why couldn't they have reduced the hours on this place instead?) Never mind that the website says it offers spaces for "casual dining"; the place just looks too trendy. We had decided, earlier, to eventually use some of our free dining there, claiming it would be impossible to be intimidated by a place whose web page leads with a header reading "More then just Plain Pasta." (Emphasis mine.) I can handle the weird capitalization, as if Plain Pasta is an actual dish, but "More then just Plain Pasta"? And the fact that the error remains there days after I (sweetly, I swear!) mentioned it on their Facebook page? Ha! They don't scare me! Except then when we looked at the place, and it just didn't look comfortable. Not physically, and not psychologically. I can do upscale with ease, but trendy? It's iffy. Is the staff going to make you feel welcome, or if they're going to be vacuous or snooty because they think it makes the experience more elite? And the decor - is it conducive to relaxing and tasting some interesting food over great conversation, or is it designed to facilitate perching and posing? I'm not saying we're not going to try Marinelli's, but those orange semi-stool chairs didn't speak to me last night. And, metaphorically? Those fussy chairs, combined with the unfixed typo, the one that suggests that my students are right when they say that nobody cares about these things, made me feel like Marinelli's is the popular girl who gets by in life despite not caring about her homework while in high school. My head explodes! So, we tried to give M some of their money back, but the cafe was closed, Marinelli's was a mindtrap, and Vig's Deli wasn't really a dining experience. We swigged the last of our free lemonades (well, I tried to, but someone picked up my glass before I could reach for the last sip) and hit the road. South Point? Silverton? "Hey, what about that Italian place we read about a few years ago? The one that's open around the clock, but somehow is a real restaurant and not a grimy video poker joint? The one we've never been able to find?" It must not have been meant to be before, because this time we easily found it, right there by the Outlet Mall on Las Vegas Boulevard, just a little south of the "Welcome to Las Vegas" sign. I could tell you about the history of this restaurant... or just link to their site. Short version: the owner's family has been running a restaurant in Las Vegas since the 1940s. She was a singer-performer on the Strip back in the day. She was also lieutenant governor for a long stretch. The place is popular with Vegas entertainers who want something other than IHOP/cafe fare after their late shows. It has just the sort of cozy, romantic, Italian restaurant lighting that you might deliberately book for your anniversary dinner. Fate, I tell you! 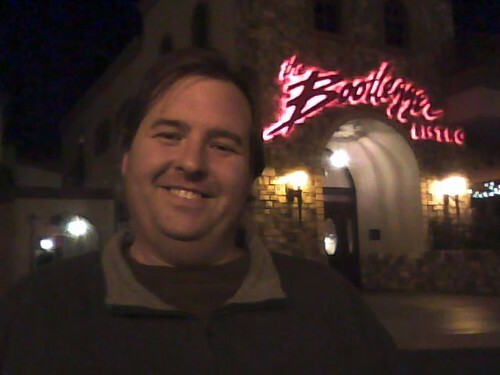 There's Mike out in front of the Bootlegger Bistro, probably around the time he was telling me that no way could we be underdressed for a 24-hour eatery in a(n elegantly bricked, but still) strip mall. And yet, it was a really nice meal, and Mike is happily willing to go back again to try something else, and not just because he's a swell guy. Bootlegger just inspires that kind of confidence, that maybe it's you, not them, and you and the menu shouldn't give up on a love match. I had the capellini al pomodoro, and it was absolutely delicious. The angel hair twirled right up onto the fork and into my mouth, where it delivered perfect proportions of olive oil, tomato, and pasta. Mike was also disappointed that, when they offer you Parmesan, they don't shred it at the table. Instead, we got an attractive glass bowl heaped with powder. "I'm sure it's not from the green canister. It's probably fresh." But Mike doesn't like the powder, even when fresh; he likes the strands. I was surprised, too, but I like the powder, so I was fine. We didn't save room for dessert. In fact, our main courses seemed barely dented. (Mike still has a meatball left over. He did like the meatballs.) Despite Mike's dissatisfactions (which sound worse here than when he was listing his impressions on the drive home), we were both happy to have finally found this place. And that is the story of our third anniversary dinner. Now perhaps Mike will wake up and go eat Indian buffet with me. Or, I may collapse into zzzz's. C'est la me.